Iron-biofortified bean varieties are combating anemia, the most widespread nutritional disorder in the world. Photo by Neil Palmer (CIAT). For a poor fairytale farm-boy named Jack reduced to selling the family’s emaciated cow as a last resort, the stalk of a magical bean led to a golden goose and prosperity. For real-life farmers in developing countries, the treasure brought by iron-rich beanstalks comes in the form of higher yields and better nutrition. More than 300 million people count on inexpensive beans as an important part of the diet, especially in Central and South America, where they originate, and in Africa. At the same time, anemia, caused by iron-deficiency is rampant. The World Health Organization estimates that over 30% of the world’s population is anemic, and that it is the most common and widespread nutritional disorder in the world. In developing countries, half of all pregnant women and nearly as many preschool children (40%) are anemic. The health effects are considerable. Twenty percent of maternal deaths are linked to anemia, as are other poor pregnancy outcomes. Among children, it can increase morbidity and impair physical growth and learning capacity. Anemia also reduces work productivity in adults. Ordinary bean varieties are good sources of iron. But by bringing together a vast range of partners, HarvestPlus, a global alliance of research and implementing institutions, is helping to develop and distribute beans that are even more iron rich. Created through conventional breeding, they are biofortified with iron, and also bred to be high-yielding and resistant to heat, drought, and viruses. Moreover, their attractive colors make them popular with consumers. For farmers like our fairytale hero Jack, who cannot afford much seed, the new beans are distributed in small packets that are both inexpensive and high yielding. In target countries, such as Rwanda, they could help farming households nearly double their iron consumption. Similar HarvestPlus partnership efforts to disseminate iron-rich beans are underway in Uganda and the Democratic Republic of Congo. 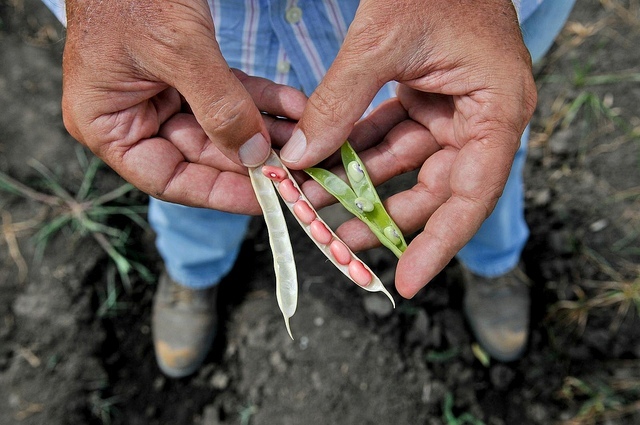 Though they come in small packets, the promise of these bionic beans is great. They offer an effective food-based strategy to help combat iron deficiency. But addressing large nutritional issues of this scale requires working with a vast network of partners. In Rwanda alone, HarvestPlus is teaming up with no fewer than 12 national partners, including Ministries of Health, Education, and Agriculture, along with a Farmer’s Federation, national research institutions, and NGOs. Among their international partners are two regional networks (Pan-African Bean Alliance and the East and Central Africa Bean Research Network); numerous universities from the US, Burundi, Australia, Tanzania, Switzerland; several private partners; and two CGIAR Centers (CIAT and IFPRI). It is these types of partnerships, and the innovation pathways they follow to address large-scale nutritional challenges, that were a featured focus of the Second Global Conference on Agricultural Research for Development (GCARD2), which took place in Punta del Este, Uruguay, 29 October – 1 November 2012. Participants included many of the kinds of partners working together on strategies such as the iron-rich beans initiative. They also made up some of the presenters looking at food security and nutrition from the large-scale challenges to the household-level impacts of practical and sustainable solutions. The purpose of GCARD2 was to be active and forward looking. Its goal is still to move from the WHY to the HOW, analyzing WHAT difference it can make in the process. For the bean farmers and consumers of Rwanda and other developing countries, the difference is tangible. HarvestPlus and its partners estimate that more than half a million household members will be eating iron-rich beans by 2013. Increasing their food security, combatting anemia – these indeed point to great rewards at the top of the iron-rich beanstalk. A great move in favor of MDG which emphasize on ensuring adequate supply of wholesome nutritious food. A word of congrats for those who are behind the implementation of the bionic bean project.